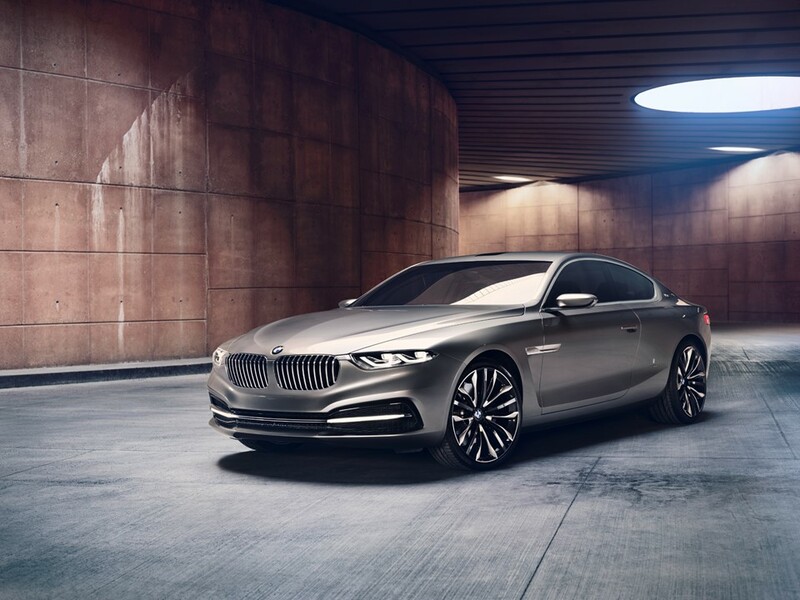 Innovative technology and modern luxury are impetus to Bayerische Motoren Werke, AG…the world’s largest manufacturer of luxury vehicles. 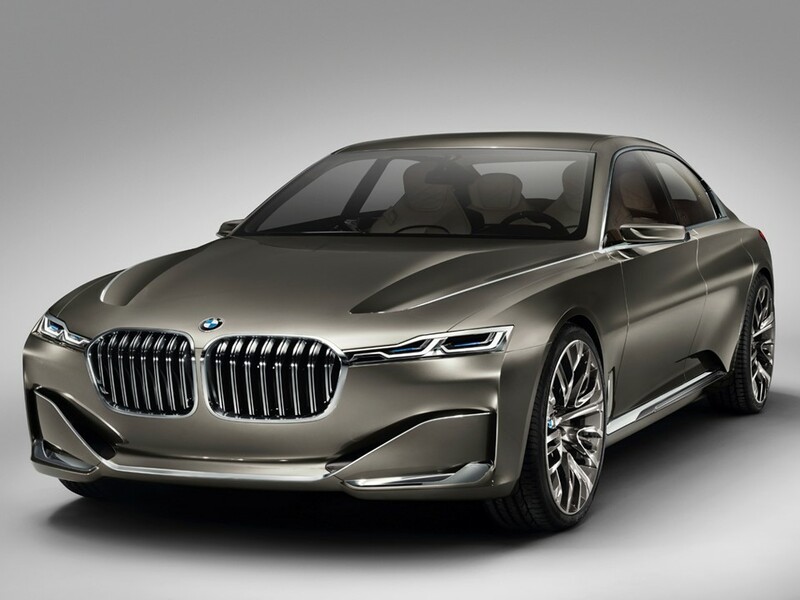 BMW is part of the formidable “German Big 3” luxury automakers. 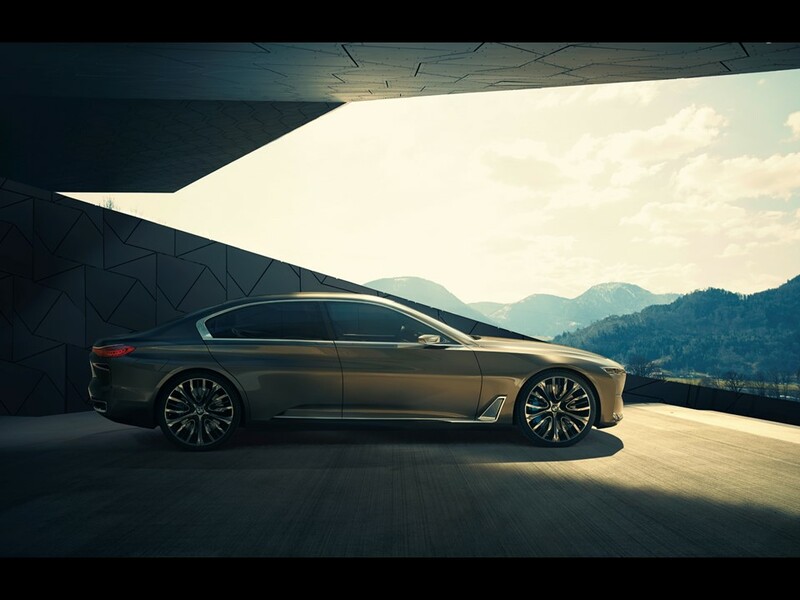 The BMW legacy continues with the introduction of the BMW Vision Future Luxury Concept. 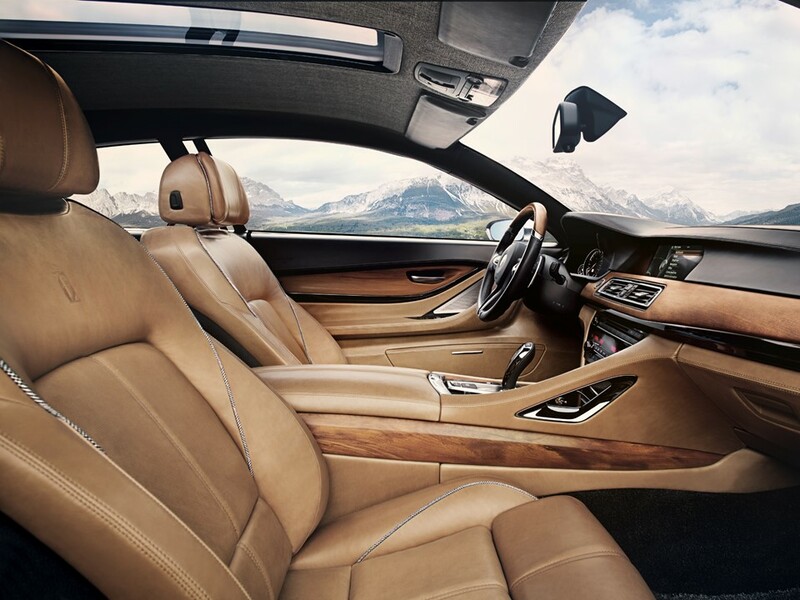 It is a forward-looking fusion of exclusivity and innovation. 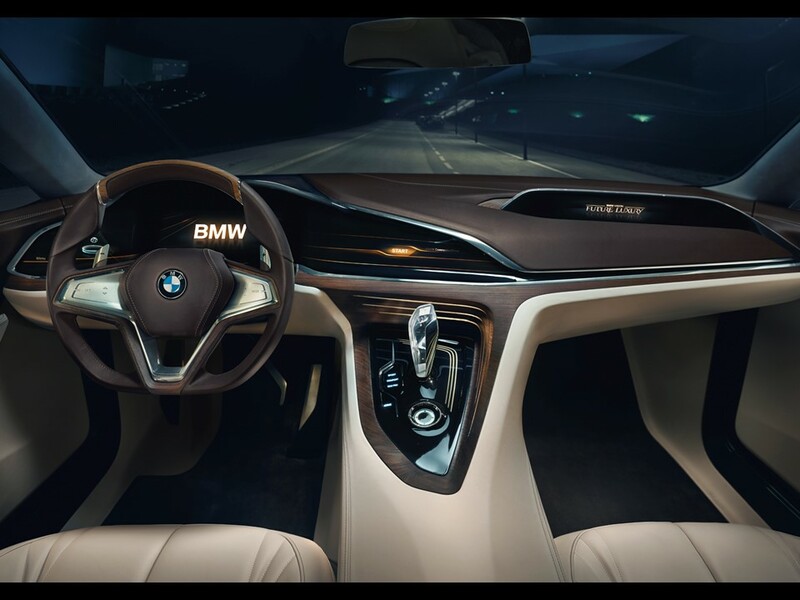 This quantum leap seamlessly integrates user interface and driving experience catering exclusively to the needs of the vehicle occupants. This daring new design represents the perfect marriage of luxury and logic. 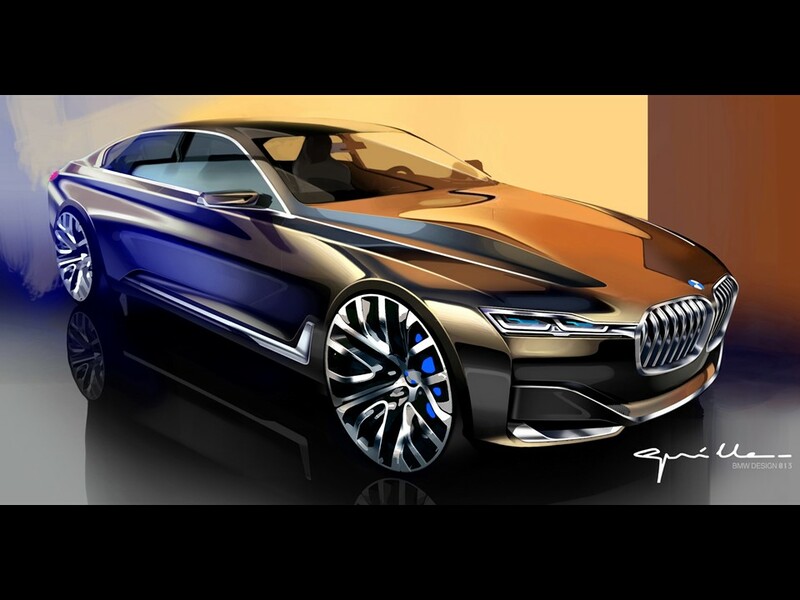 The BMW Vision Future Luxury Concept made its world debut at the 2014 Beijing Motor Show. 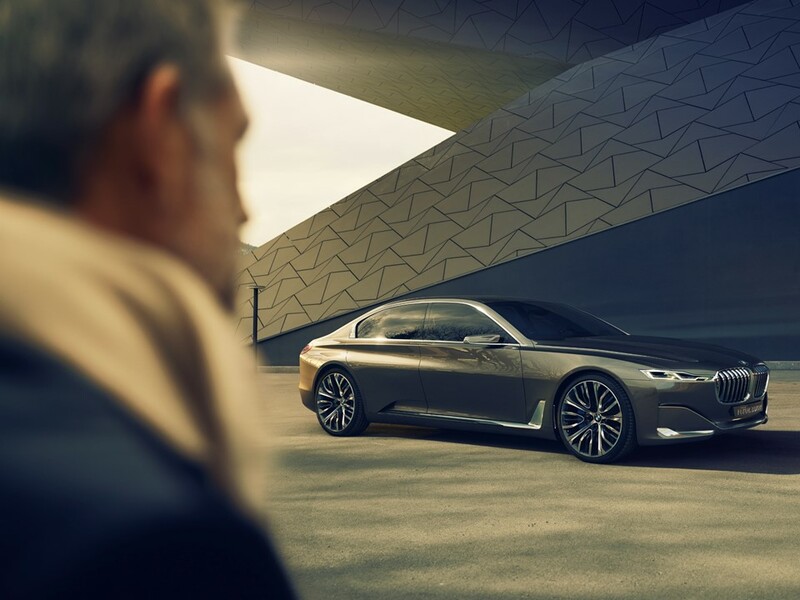 The BMW Vision Future Luxury forecasts 21st century luxury and a glimpse into the evolution of the brand. 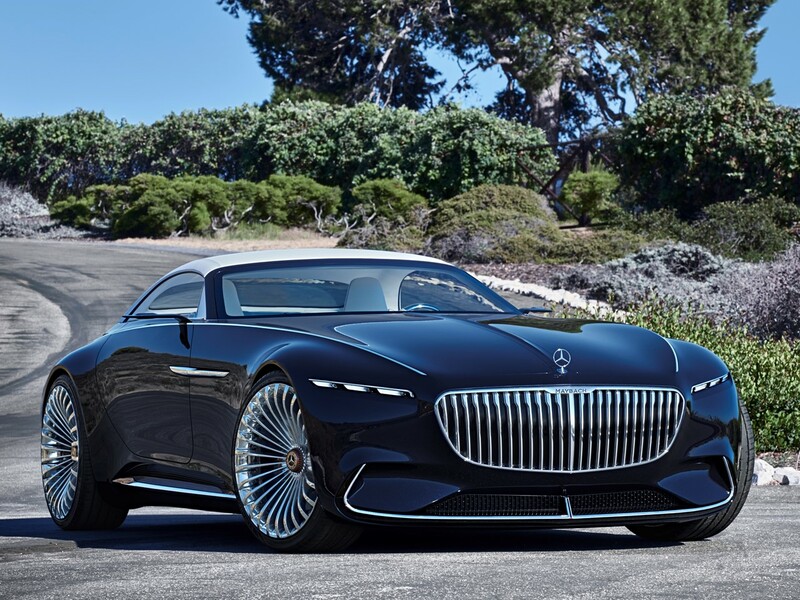 Visionary concept vehicles such as this escalates contemporary luxury through technology and precision crafting to new levels of exclusivity and supremacy. 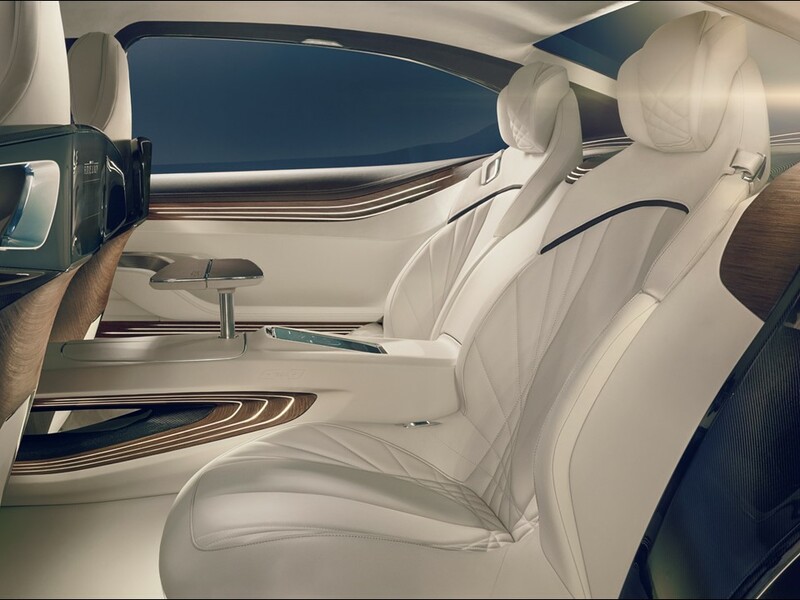 These innovations deliver a luxury experience composed of lightweight engineering and a new user interface design. 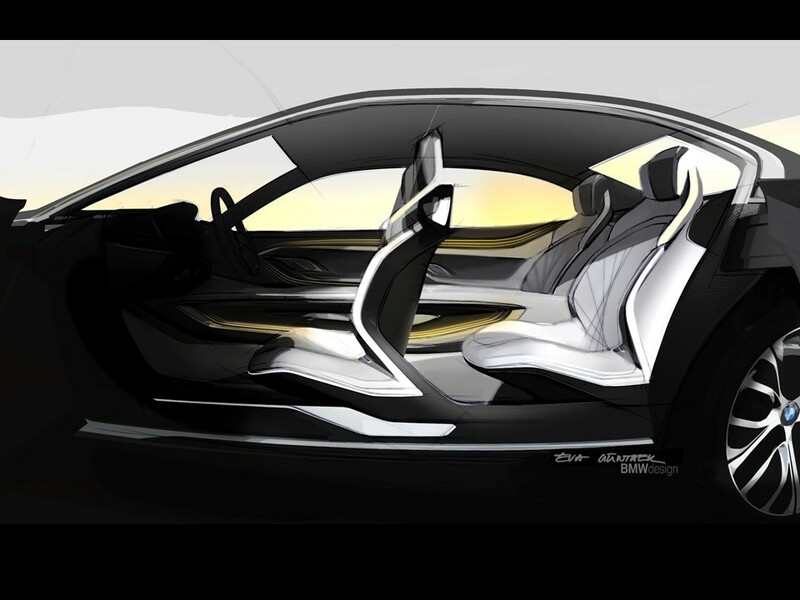 Carbon-fibre as a material is optimized in the Vision Future Luxury’s architecture. This technology is lightweight but rigid in design. 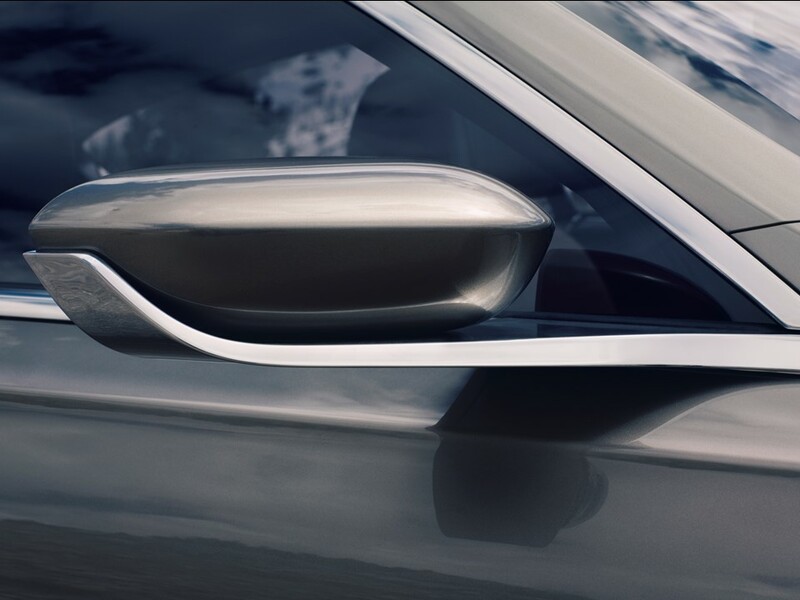 Individually constructed components come together forming virtually seamless and very elegant fluid surfaces. The process uses layers of materials scaled down to appropriate depth for the need intended. This design expresses both form and function. The car’s “B” pillars were minimized emphasizing aesthetics due to this process. The carbon-fibre construction allows seat frames to be integrated into the car’s load-bearing structure. 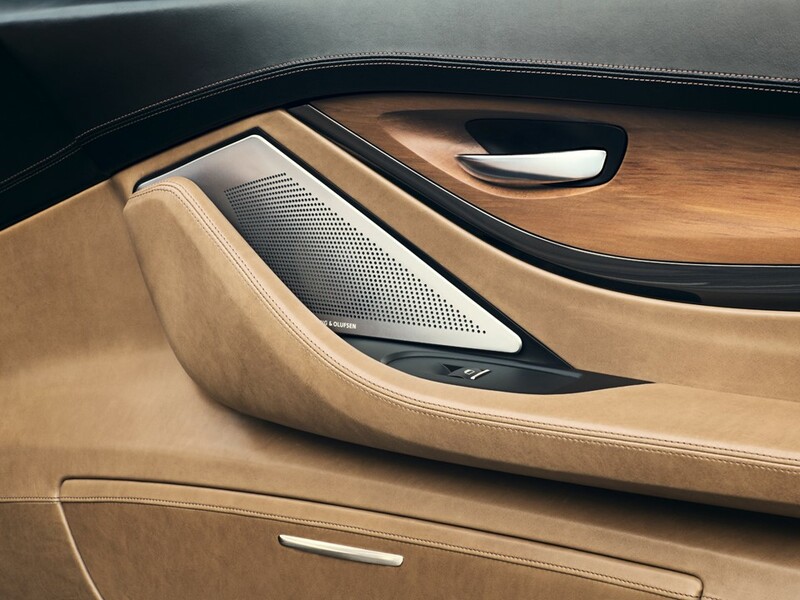 The door sills and center console are an integral part of the architecture’s rigidity. 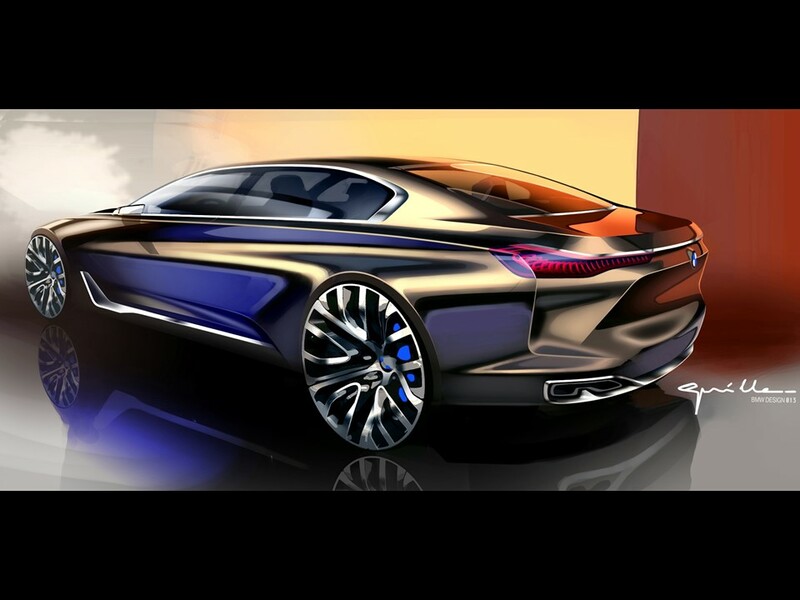 The BMW Vision Future Luxury is an avant-garde concept design which possibly hints at the 7-Series replacement. 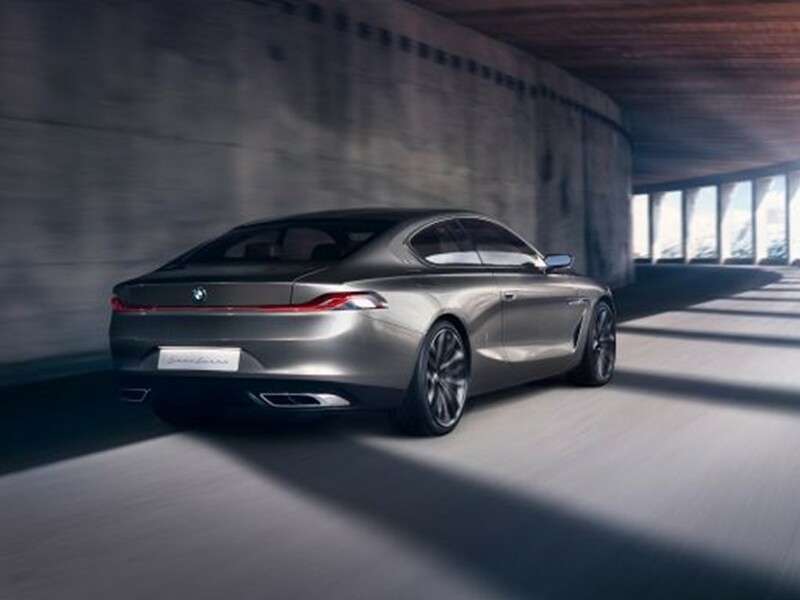 It is a technological showcase of BMW features and components that will go into future production cars. The exterior is designed for emotional response. 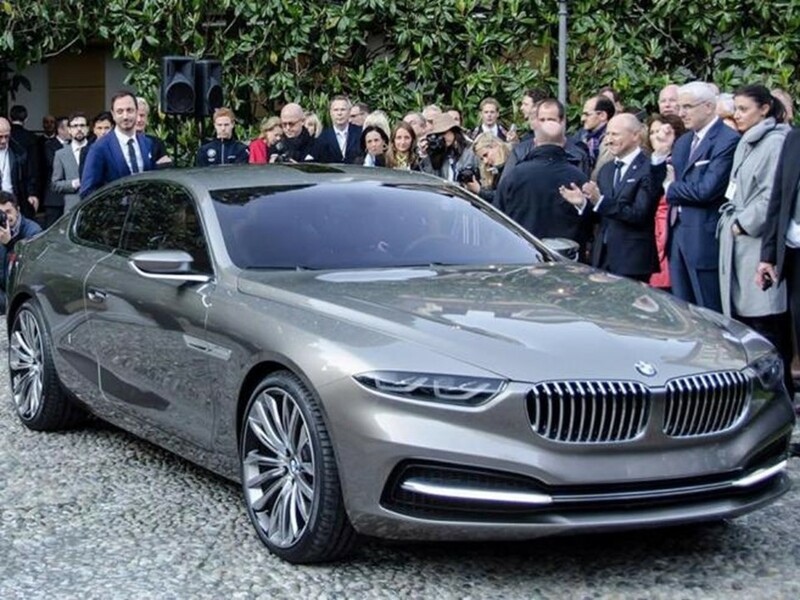 The Vision Future Luxury harmonizes with the BMW Gran Lusso coupe concept introduced at the Villa d’Este Concorso d’Eleganza May 24, 2013 in Italy. 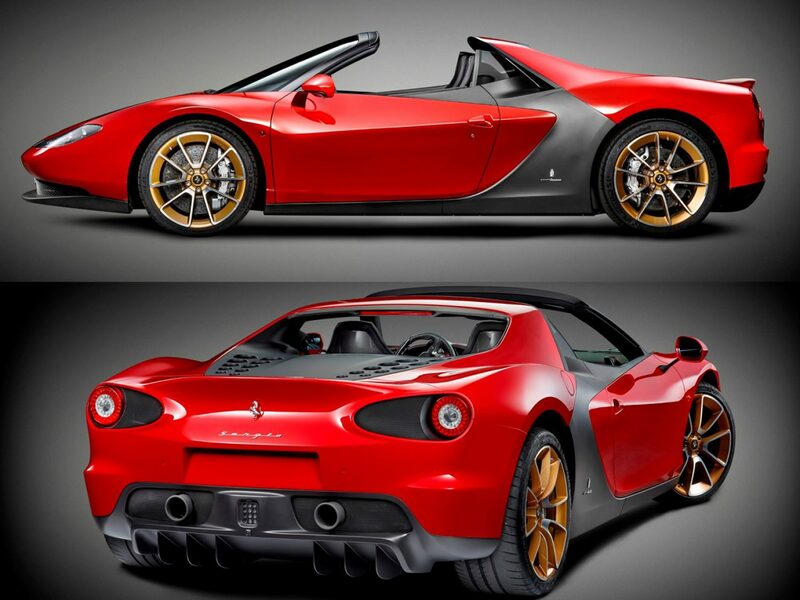 These represent coupe and sedan versions of “The Ultimate Driving Machines” to come. 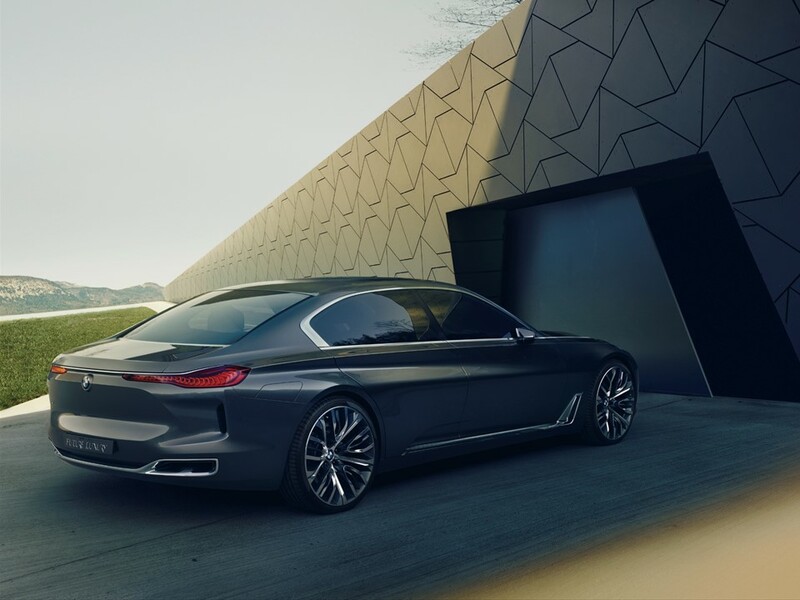 BMW is an automobile of evolution…the brand realizes the need to constantly refine to keep abreast of the cutting edge technology in the science of automotive design. 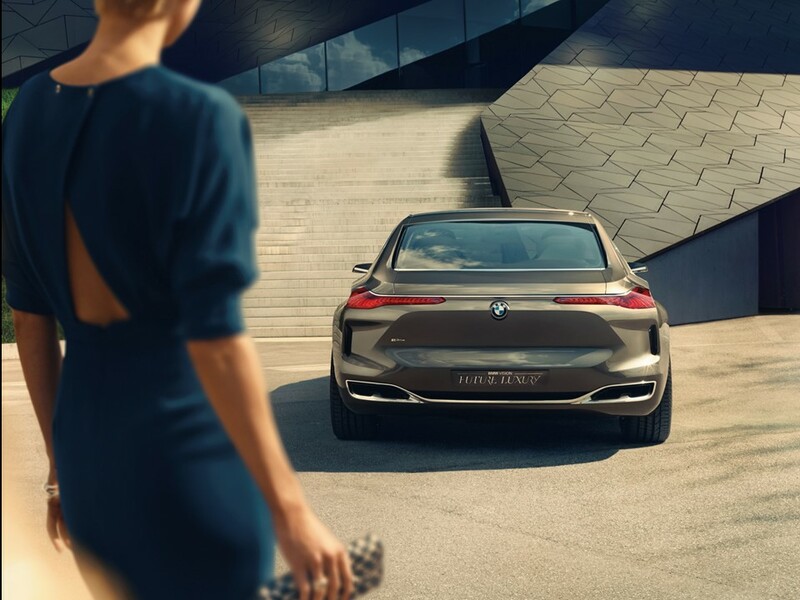 The familiar “Hofmeister kink” dramatically augments the Vision Future Luxury’s design fluidity. 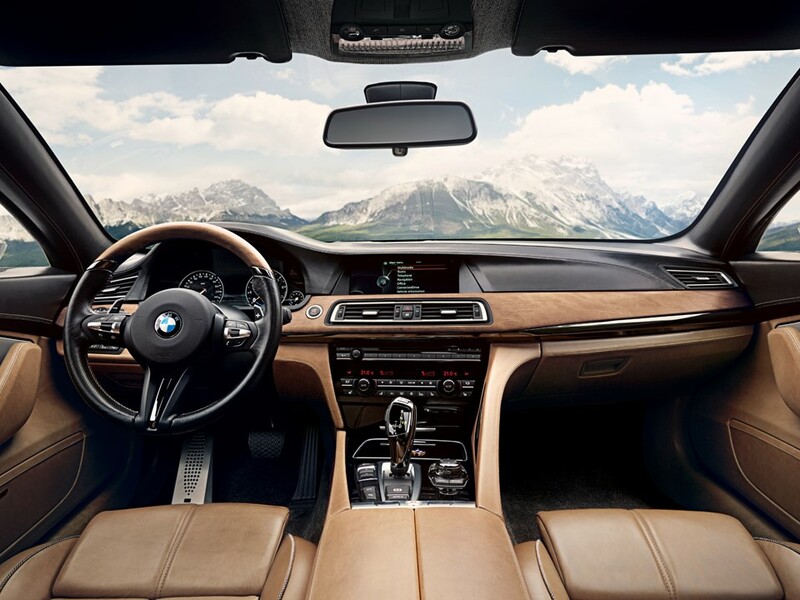 It is 21st century in attitude and unmistakably BMW. 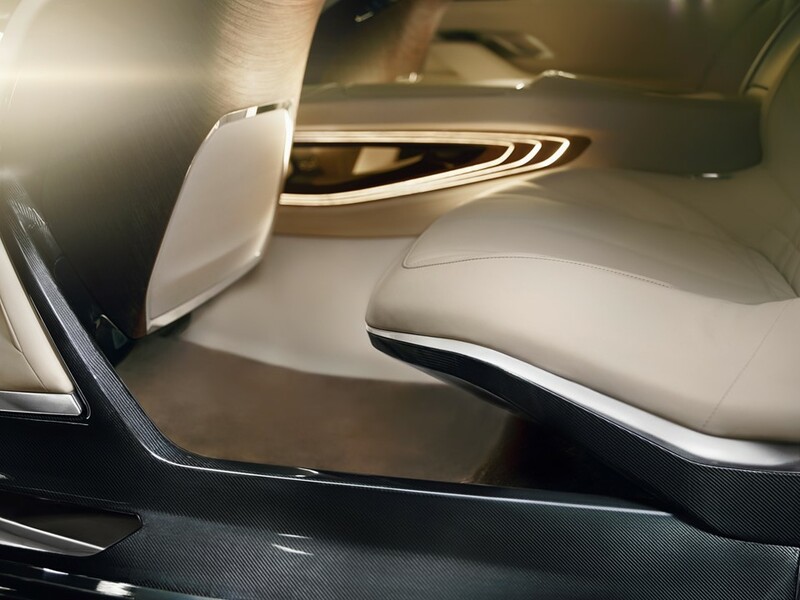 The classy forward-opening rear coach doors eases the entry to the two rear individually adjustable lounge seats. 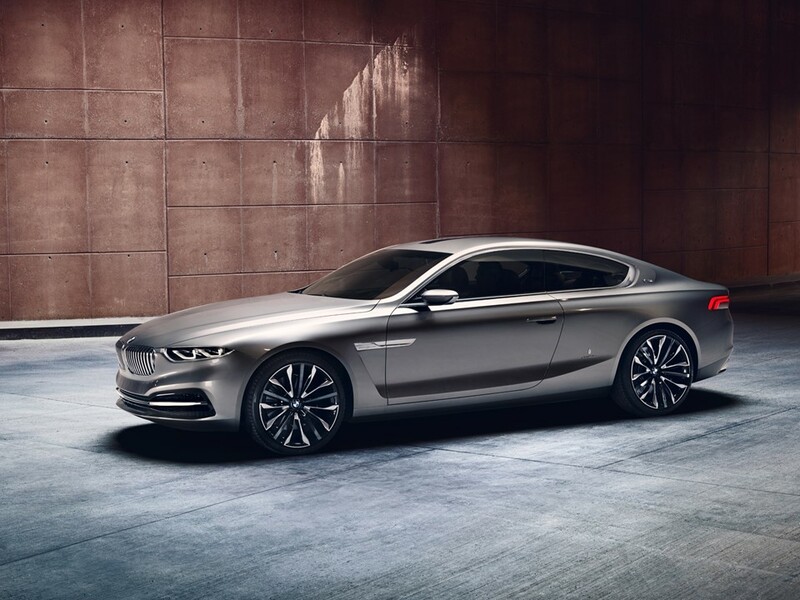 Its coupe-like silhouette is designed to help channel airflow. 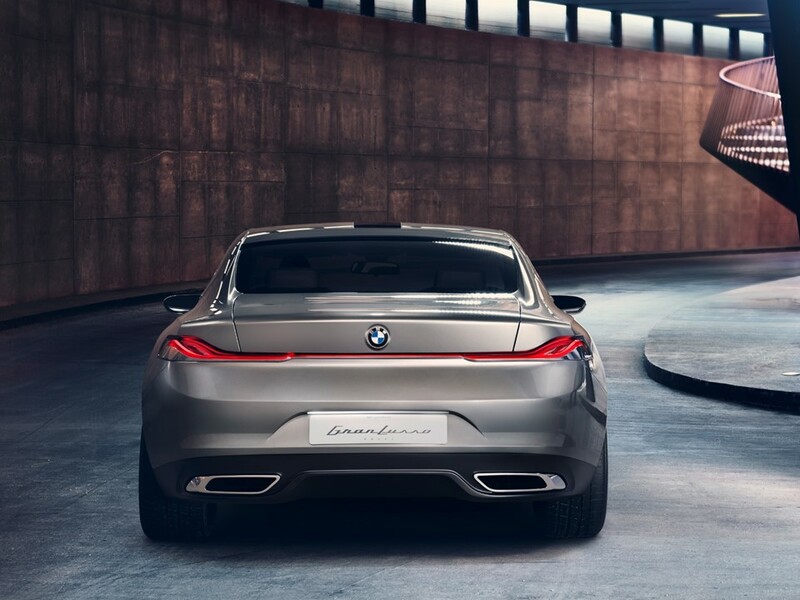 The sloping boot lid and coupe-like roofline significantly reduces aerodynamic drag. Optimal channeling of airflow is aided by the “Air Breather” system at the rear of the front arch, a “C” pillar with internal air channeling, and openings in the rear apron that vent air from the wheel arches. 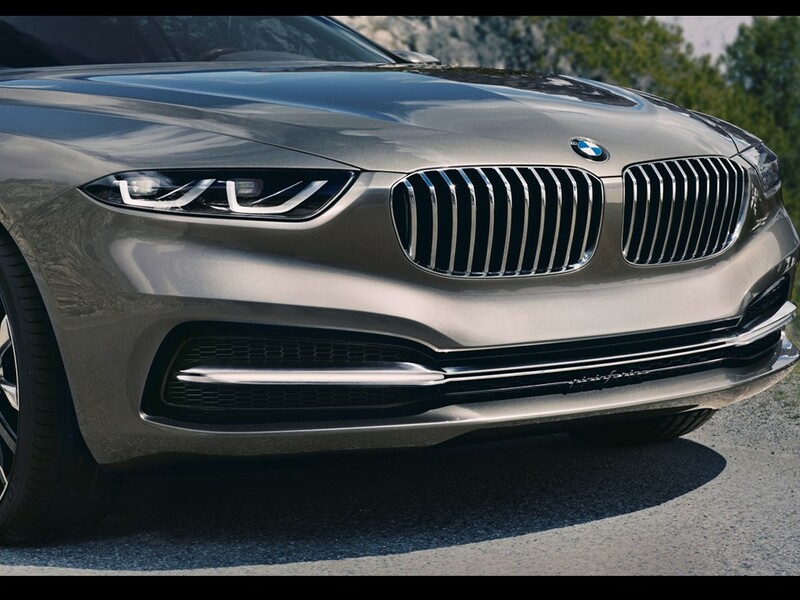 The classic look of the front end design displays BMW heritage with the traditional dual kidney grilles and twin headlamps. 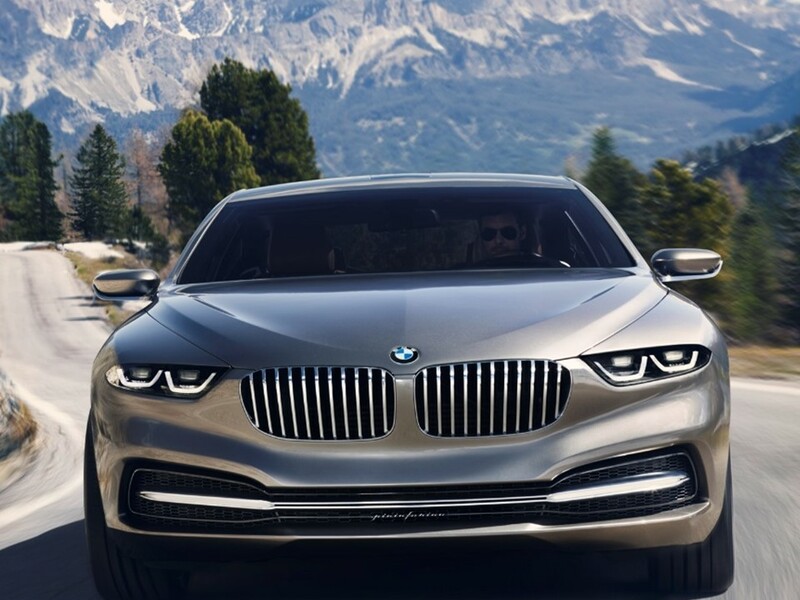 The BMW Vision Future Luxury Concept uses laser light technology that establishes new standards in terms of brightness, range, and intensity. The concentrated parallel light beam is up to 10 times more intense than that of an LED system. Its reduced energy consumption and packaging requirements makes laser light technology a prime candidate for use in future vehicles. 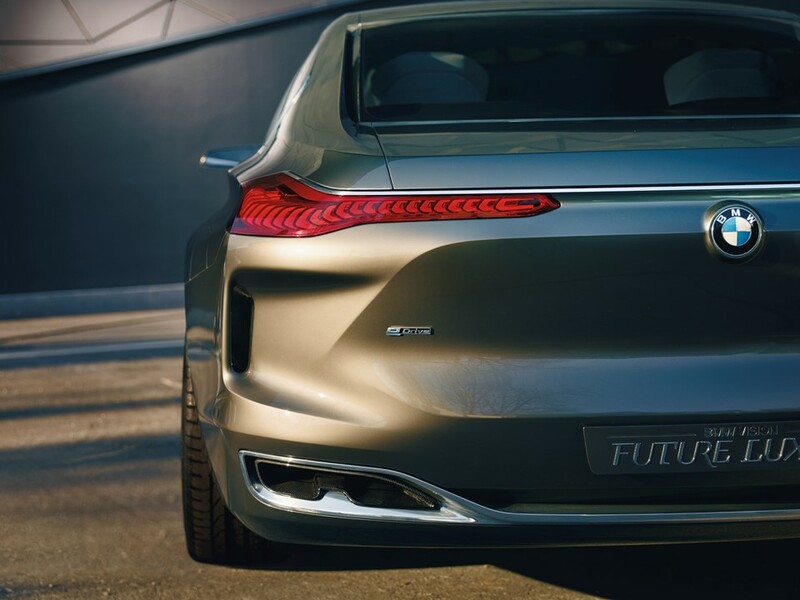 The Vision Future Luxury Concept uses Organic LED (OLED’s) elements for the taillamps. OLED’s are wafer-thin organic semiconductor layers sandwiched between two electrodes that are about 400 times thinner than a human hair and does not require reflectors to produce the desired broad light dispersion. This is new 21st century technology that creates new ways of lighting in and around the vehicle. 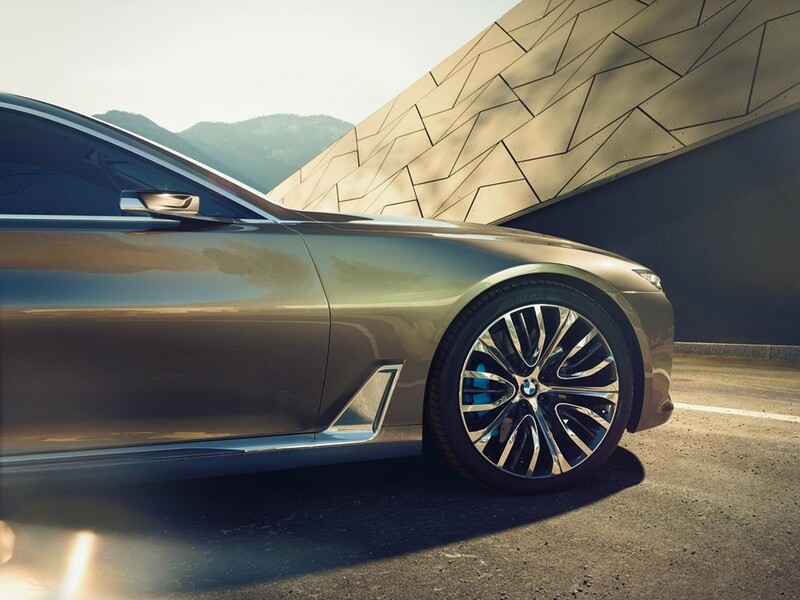 Innovation is what “The Ultimate Driving Machine” does best. 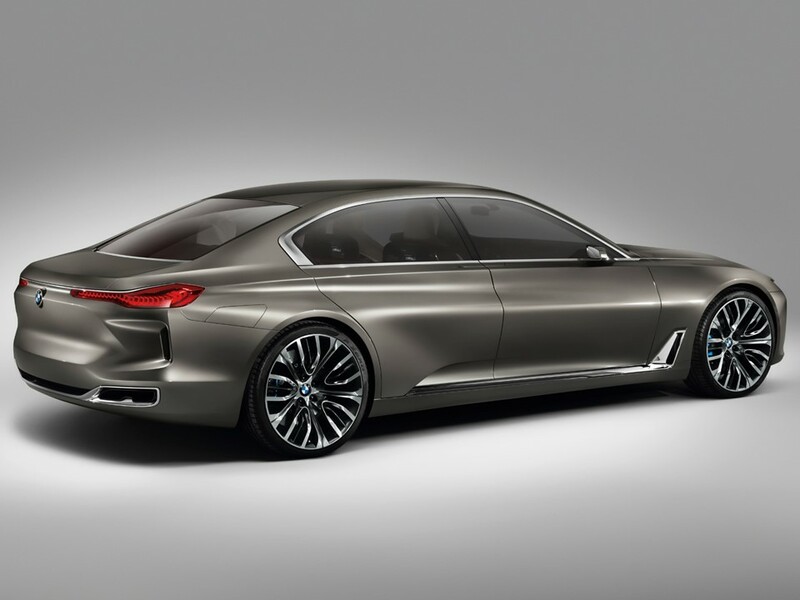 The BMW Vision Future Luxury Concept is finished in a Liquid Platinum Bronze that seems to glow. 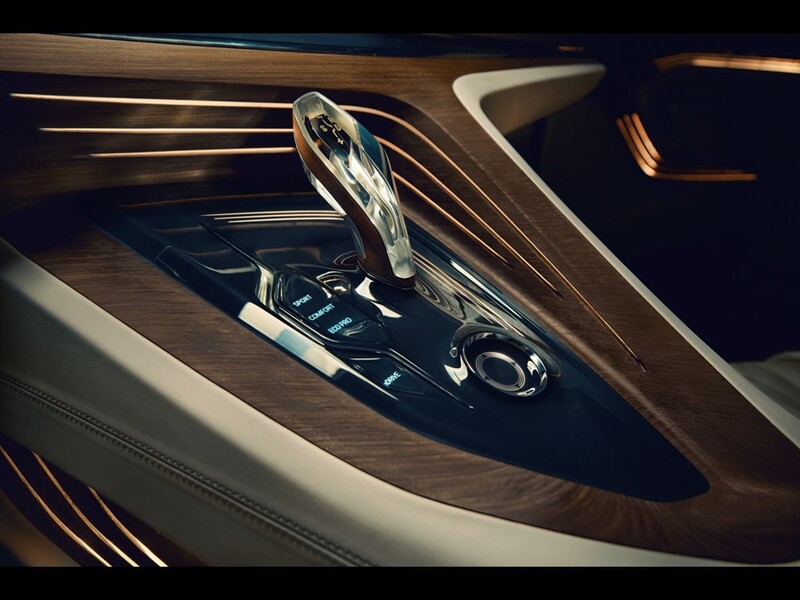 It augments the car’s hand-sculpted design. The classic simplicity of its stature is uncluttered and elegant. 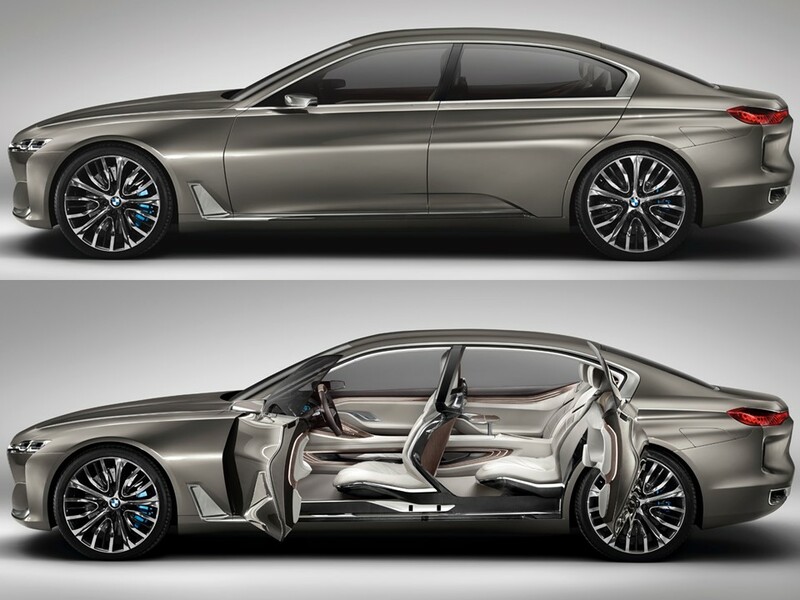 Its formidable BMW DNA is obvious. 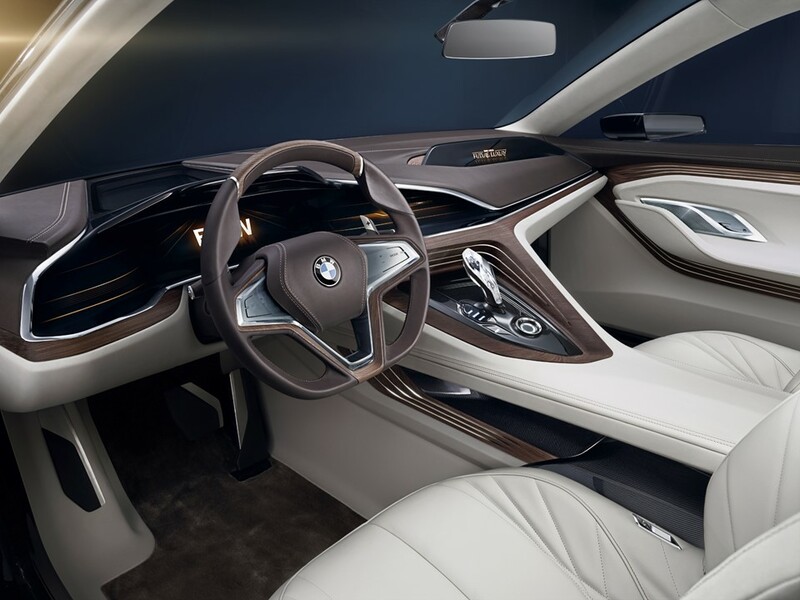 The BMW Vision Future Luxury Concept features a new user-friendly interface with improved integration of BMW ConnectedDrive apps. The driver is surrounded by a wrap-around cluster of displays. The front seat passenger also has access to an additional infotainment information system. 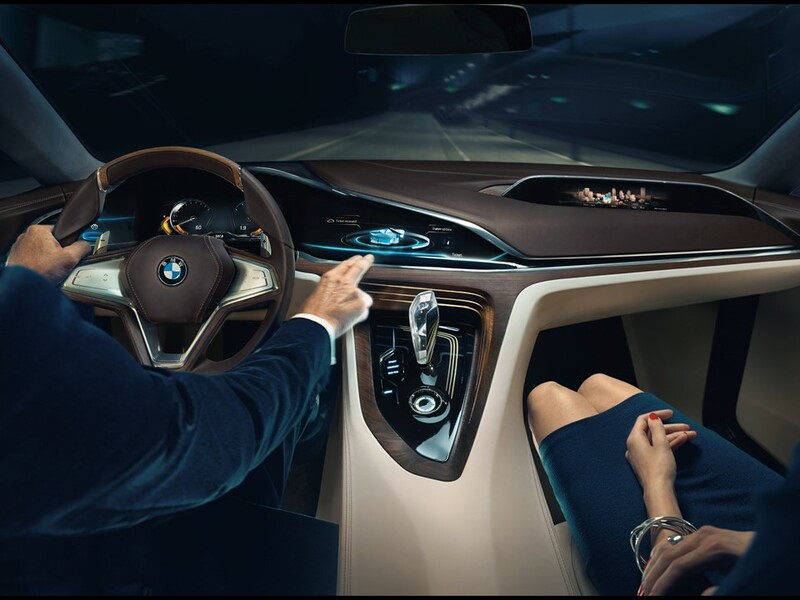 The BMW ConnectedDrive Luxury Concierge service is displayed where it does not risk distracting the driver. Rear seat passengers also have their personal set of displays and controls for multi-media functions. 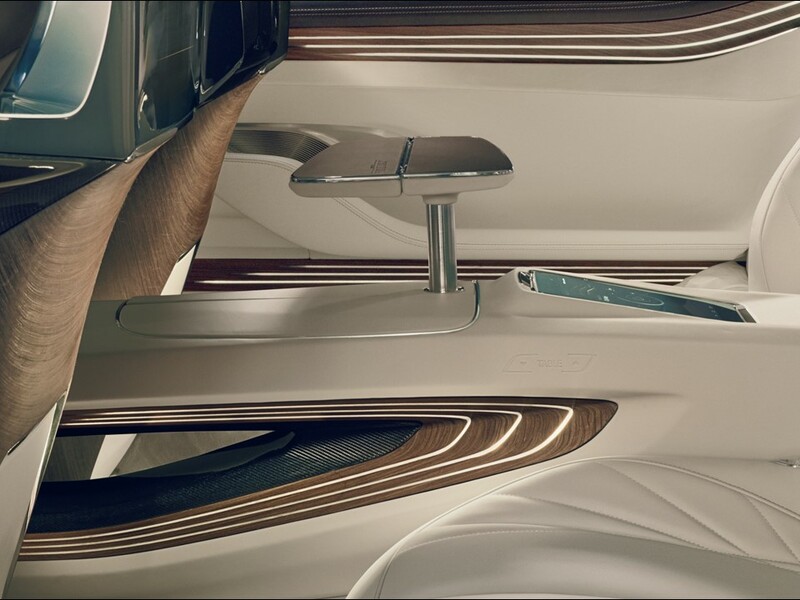 The driver and passengers each have their own “space” in this ultra-exclusive Flagship. Interior space seems to flow seamlessly into the solid structures of the instrument panel. The “head-up” display projects information directly in the driver’s line of sight onto the road. This technology highlights driver assistance functions such as speed limit information and the “Traffic Light Assistant” which provides real-time information regarding traffic light phasing. 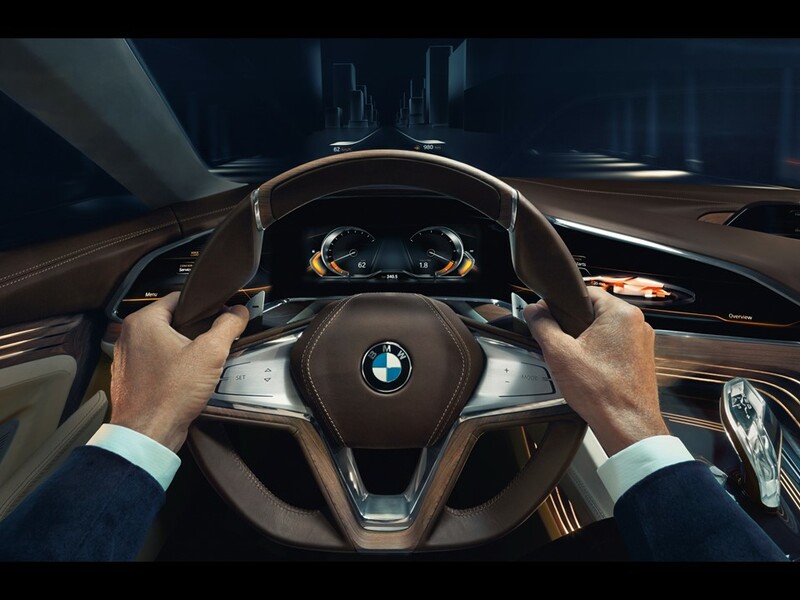 The BMW “Driver-Centric” cockpit includes 3-D display technology. The vision level of the instrument panel ingeniously coordinates the displays into the styling creating an impression of unprecedented depth and spaciousness. The design of the instrument panel complements the design of the displays themselves. 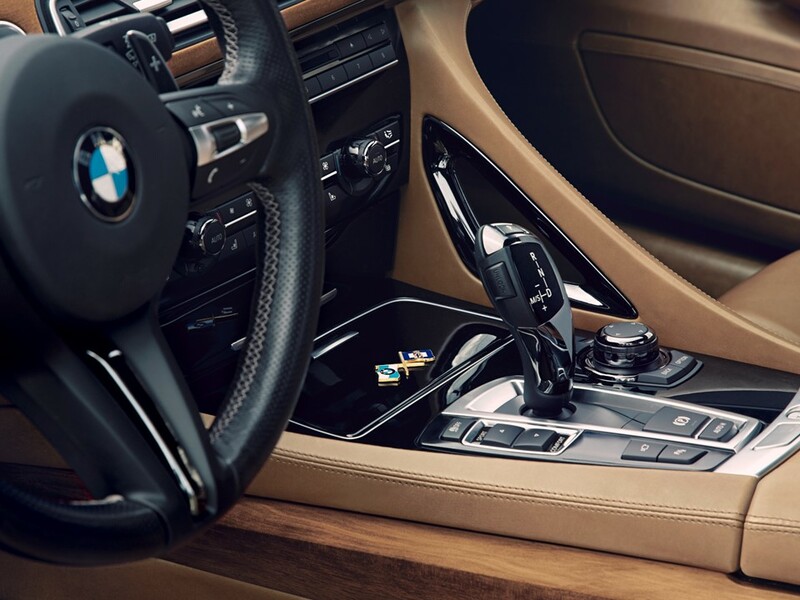 The finest quality aniline leather in Batavia brown with a lighter shade, silk nubuk leather, combined with layered lime wood offers a unique visual appeal to the cabin. The interior was also designed to trigger emotional appeal where the eye sweeps continually entertained by light, colors, shapes, and textures. Deep pile pure silk carpets are luxuriously underfoot. 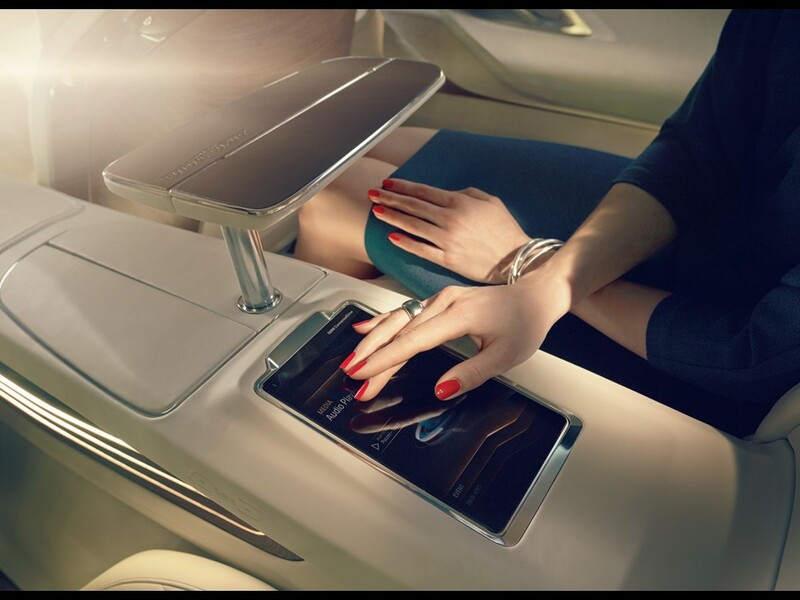 Rear seat passengers have two displays set into carbon surrounds, with a detachable “Rear Seat Touch Command Tablet.” These displays coordinate with front displays including BMW ConnectedDrive services with the Luxury Concierge services. 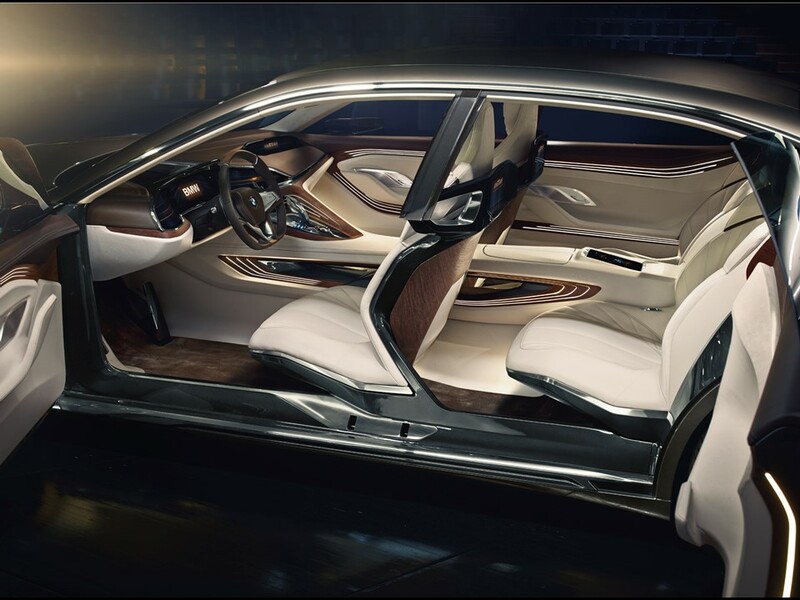 Internet-based videos and music streaming are just two of the many multi-media perks in the BMW Vision Future Luxury Concept. All content and functions are controlled from the rear compartment using the Detachable Rear Seat Touch Command Tablet in the center console. Rear seat passengers have a retractable table and angled displays. Mood lighting from strategically placed lighting slats into the wood trim creates a private not to mention cozy environment. Change is an inevitable part of life. The world in which we reside is constantly changing at an accelerated rate. 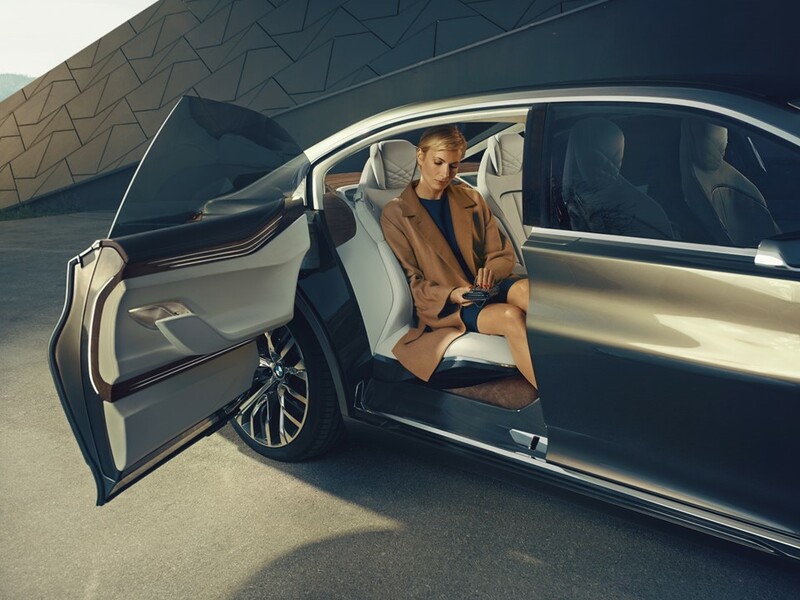 BMW is all about change…their view is innovation with omniscience, which has driven the brand escalating it to new levels of exclusivity and supremacy. 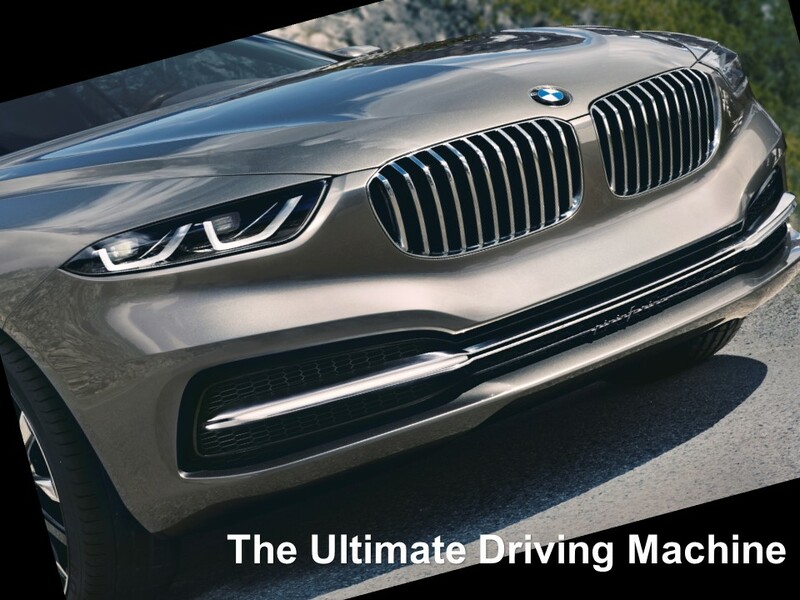 BMW is always on the cutting edge of technology with precision engineering. 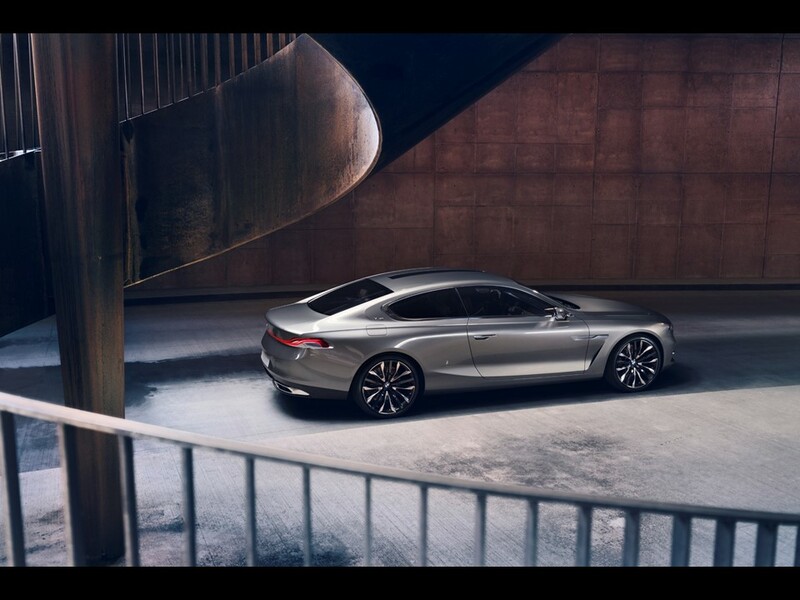 Evidence of these superlatives are the BMW Vision Luxury Concept and the BMW Gran Lusso coupe. 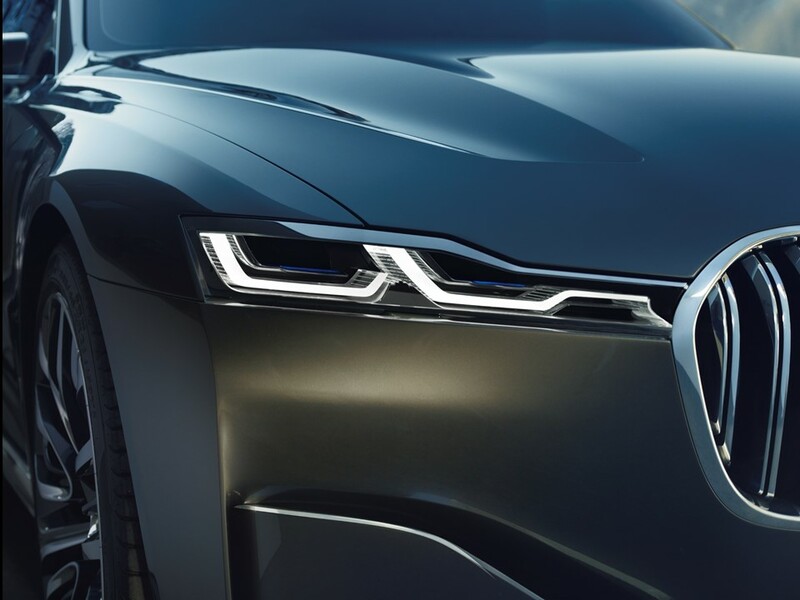 The brand is a world leader in automotive design and engineering, always a step ahead of the industry. The accelerated pace of the rate of change in technology is a staggering fact of life…what appears to be current or “state-of-the-art” today becomes obsolete tomorrow. BMW has always moved forward faster than the speed of light. 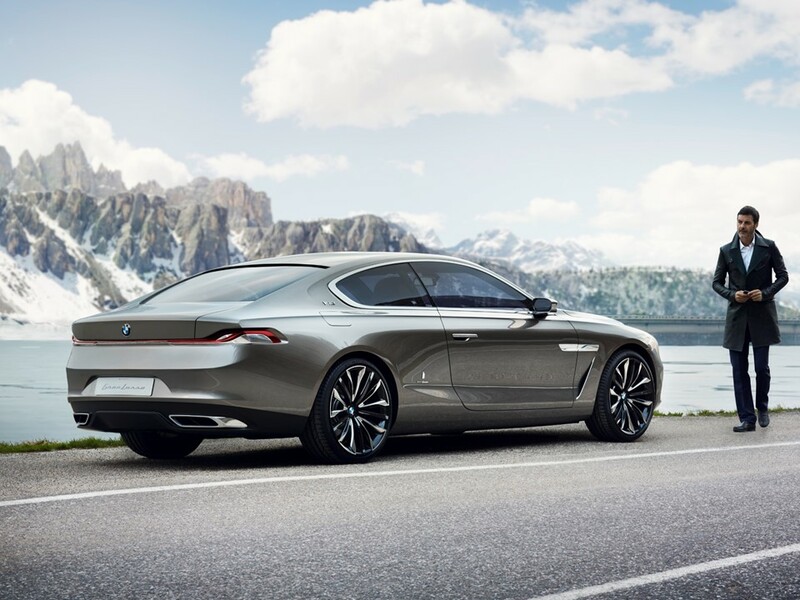 “This elaborate creation is a one-off design that captivates the observer at first glance with its Italian exclusivity and finesse.” As the result of an elite collaboration between BMW and Pininfarina Design Studios of Italy, The BMW Pininfarina Gran Lusso coupe was introduced. The Concorso d’Eleganza from the Grand Hotel Villa d’Este is the most significant of all events celebrating Historic Motor cars. This has been celebrated as early as 1929. Since its revival in the 1990’s the Concorso has improved, the beauty of the setting, hospitality, and efficiency in organization. All of this excitement at the Grand Hotel Villa d’Este and Villa Erba are to increase the public awareness of the International Press and mainly to showcase the elegance, originality, and state of preservation of the precious automobiles participating in the event. The focus is on design, originality and perfect preservation, and the spirit of bringing together the most important and beautiful cars from all over the world. The Hotel Villa d’Este located on beautiful Lake Como in Italy, welcomes guests to view the most beautiful cars in the world by category which celebrate History or Milestones. 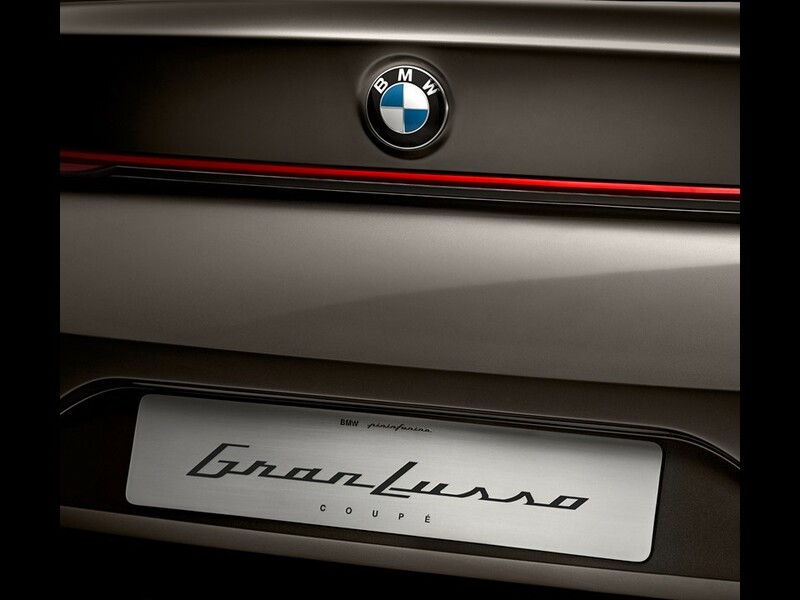 BMW’s first collaboration with renowned Italian designer Pininfarina created this Luxury Grand Tourer. 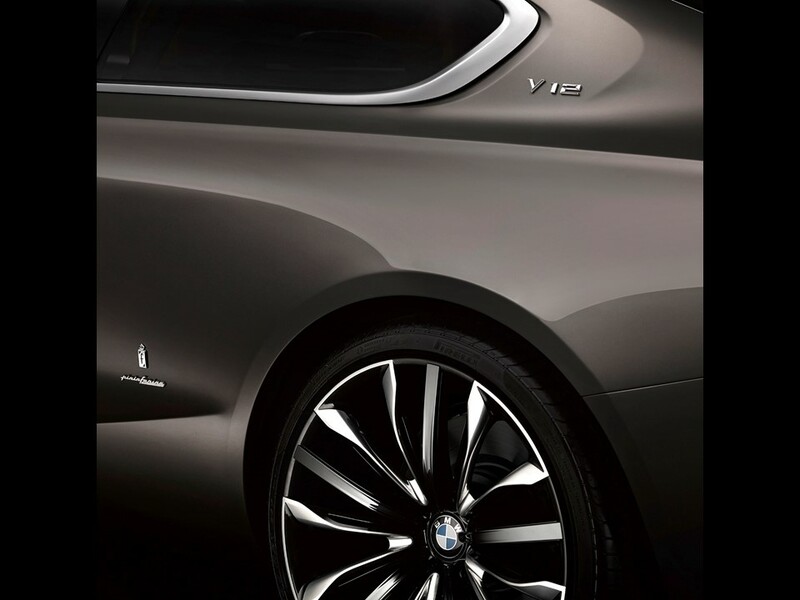 It is sheer elegance and exclusivity with the car’s exciting contrast of materials such as its 21” wheels made with matt-sheen aluminium with black and black chrome accents. A Twenty-first Century look augments its authoritative appearance. 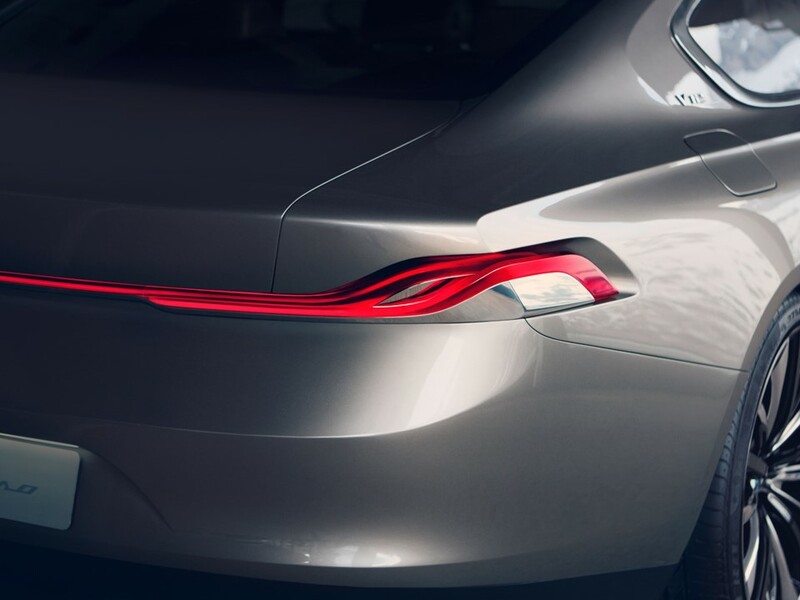 At the rear, the car’s jewel-like LED tail lamps with their open design allow air to circulate around them. The contemporary look created by the omission of “B” pillars and the use of frameless doors create an airiness adding extra light making the cabin appear larger. Its long wheelbase and stretched bonnet with short overhang makes the car look longer. 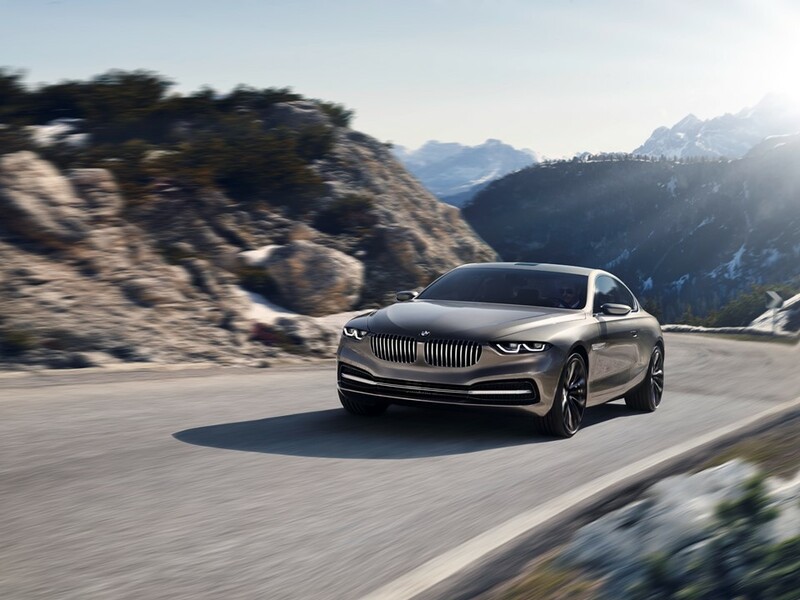 The smoothly sloping roofline enhanced with the BMW signature “Hofmeister Kink” which is the forward bend in the window C pillar, adds to the dramatic side profile. 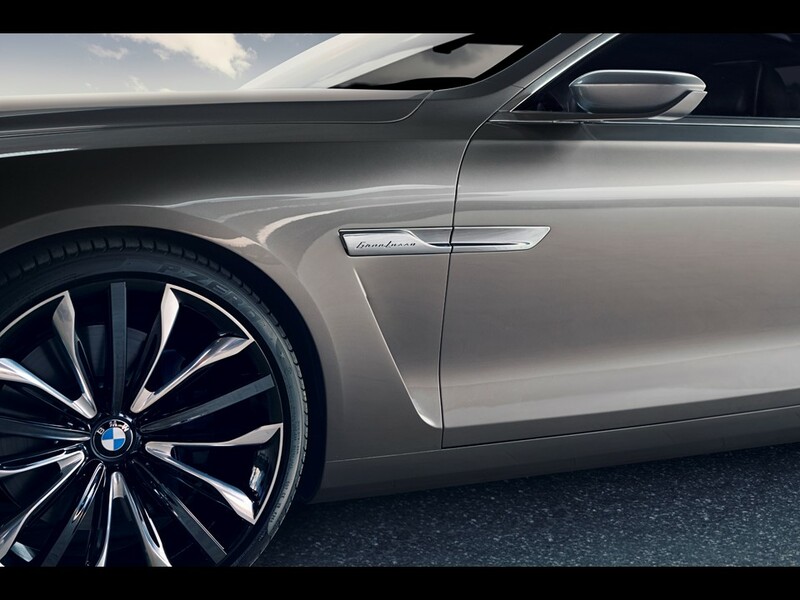 The convex taperings make a dynamic presence….an understated elegance that only BMW could think of. 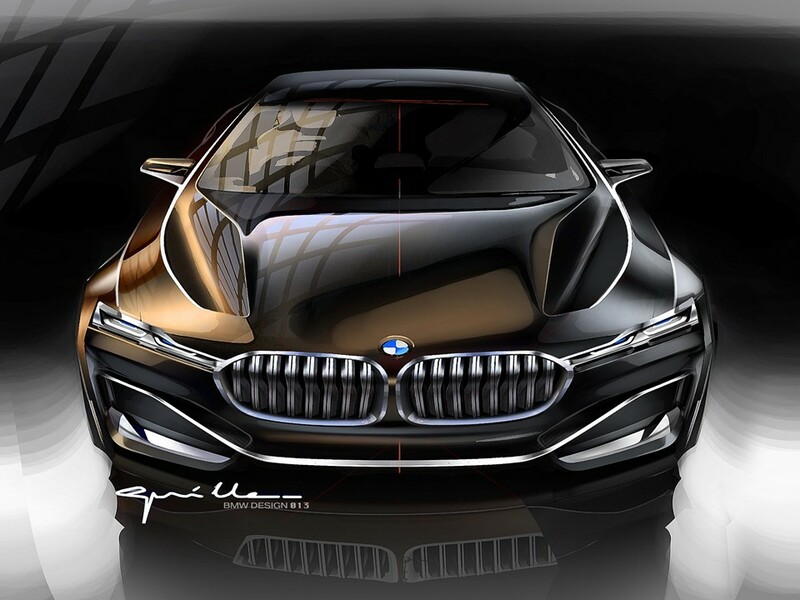 In fact, BMW is always in pursuit of creative exchange with other design studios, which is another example of BMW’s restless quest for excellence and further development through partnership programs. Prehistoric trees buried and preserved in peat up to 50,000 years ago in New Zealand’s North Island produce the exotic Kauri Wood gracing the Gran Lusso’s cabin. Buried by unexplained acts of nature at the end of the last Ice Age, the wood has been preserved by being sealed in a chemically balanced environment. Some of the trees grew at least 2,000 years before being buried. The average girth of the trees is around 40 feet wide and over 200 feet high. Extraction of these logs is time-consuming, expensive, and technically difficult requiring the skills of trained specialists in the operation of the heavy machinery in wet conditions to bring the logs carefully to the surface. Kauri wood is among the rarest timbers in the world, and being preserved in swamps, the wood can be processed like fresh timber after its retrieval. 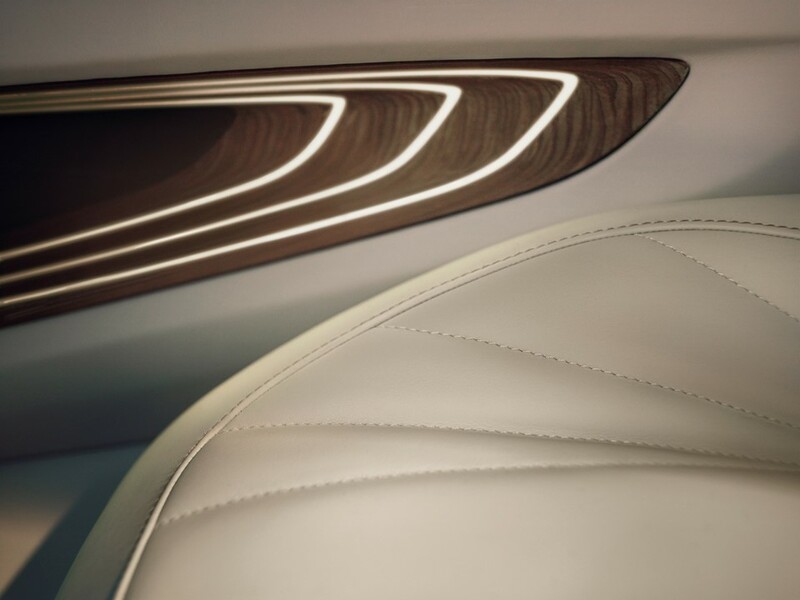 The wood trim of the Cabin for the Gran Lusso comes from a single piece of wood. Kauri wood is known for its iridescence, the shimmering streaks are called ‘white bait’. This particular wood grain is named after schools of New Zealand white bait fish that emit a similar pattern swimming in one direction. The Gran Lusso’s wood cabin glows with iridescence in shades of gold to red to brown depending upon the angle it is viewed. This rare wood combined with the unique mystery of this car adds extra drama. 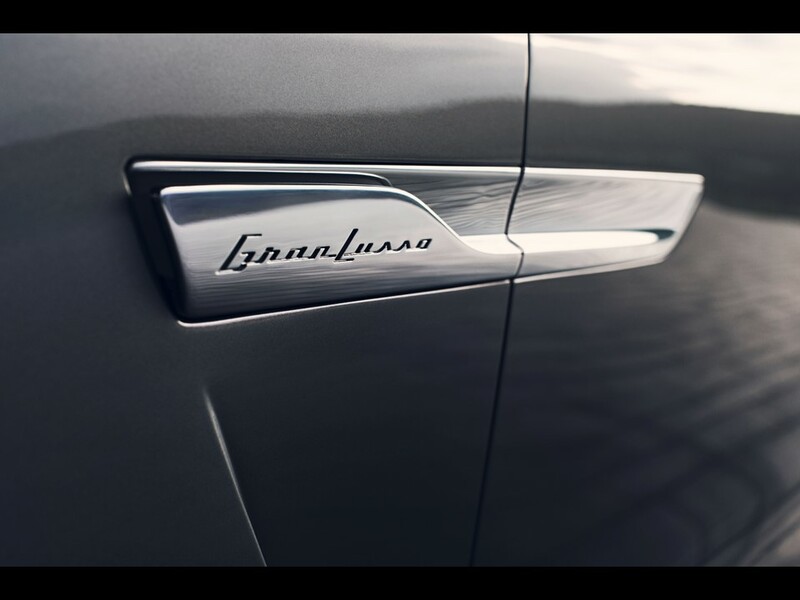 The Gran Lusso sports a leather clad cabin. Not just any old leather, this is Foglizzo leather which is the finest made Italian leather. Foglizzo is synonymous to bespoke and is available in numerous colors and different grains of customizable leather, specializing since 1921. Foglizzo is absolute perfection in the leather industry. BMW has always been an “absolute” haven’t they?